The Pro Shop at the Fox Hollow Golf Course provides the latest in golf apparel, golf shoes, golf clubs and merchandise for the golfer in you at prices to suit your budget! Fox Hollow has become known over the years for the large selection of ladies wear! This year is no exception. The styles are coming in daily and the 2019 ladies wear is not going to disappoint. The latest fashion trends prove to be fun and flirtatious. Come down and browse through various designers including: Nivo, Nike, Sport Haley, Cracked Wheat, Under Armour, Tail, Jo Fit ,Sun Ice just to name a few collections. We haven't forgot the Men either! The 2019 styles are all fresh off the tour. The new line up includes: Under Armour, Nike, Foot Joy, Travis Mathew, Sun Ice . With this selection we are certain to be able to dress you in the latest fashion and if we don't carry an item we can always special order it for you! Once you are outfitted don't be shy to check out our selection of golf equipment as we carry all the top brands with Calgary's most competitive pricing. If you are in the market for a new set of clubs our trained professional staff will custom fit you and order your set today with a price guarantee we won't be undersold ! 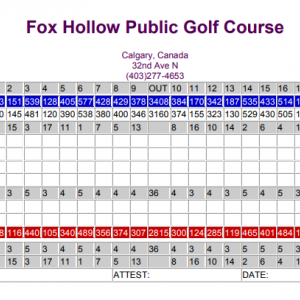 Fox Hollow was the proud recipient of the 2013 PGA of Alberta Merchandiser of the Year for Public Golf Courses. GIFT CERTIFICATES are also available year round to surprise the golfer in your life! Call us at 403-277-4653 for a tee time (please have a valid credit card ready to book weekend times) or to inquire about our free golf for juniors program or our very popular twilight & dine specials.